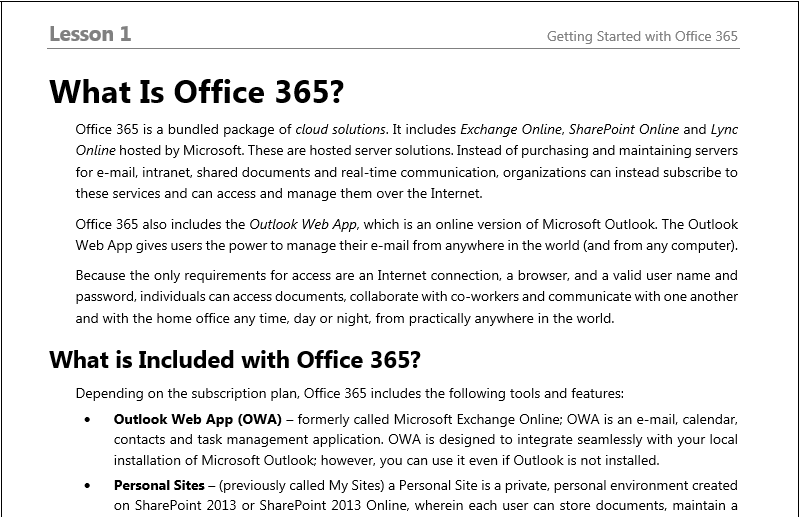 Microsoft Office 365 is a software suite powered by the cloud, meaning it is always up to date. Office 365 applications and files are available from virtually anywhere — PC, Mac, phone, or tablet — giving you the freedom to work on the go. This courseware is designed for the Office 365 user and would be beneficial for anyone using it for both business and/or personal use. Therefore, from home to business, from desktop to web and the devices in between, you will be fully equipped with the tools and knowledge to get work done. Office 365 courseware gives users a fundamental understanding of how Office 365 is administered, deployed and managed, and teaches users how to be productive with it. The Office 365 courseware teaches users how to sign in, access their personal profiles, and navigate and perform work in the Outlook Web App, the Lync client, and the SharePoint Online team site. This Office 365 courseware also contains exercises that users can use to learn each of the features discussed in each lesson. To get the full experience of working with Office 365, we’ve built and created a full Office 365 solution exclusively for our customers that gives you the opportunity to work within the program as a member of a fictional company. This hands-on, interactive experience coupled with the courseware objectives gives users an authentic working example of Office 365. 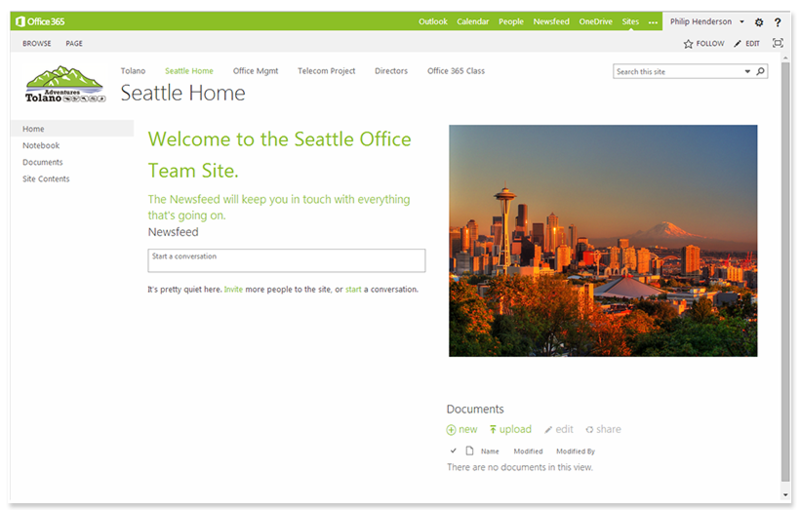 Contrasting Outlook Web App and Sharepoint Online … and more! Linking and managing Linked contacts … and more! Specifying meeting options … and more! Co-authoring documents … and more! Want to see how it will all look and feel like? Take a look at a sample from our Office 365 coursware and get a preview of what each lesson will be offering. 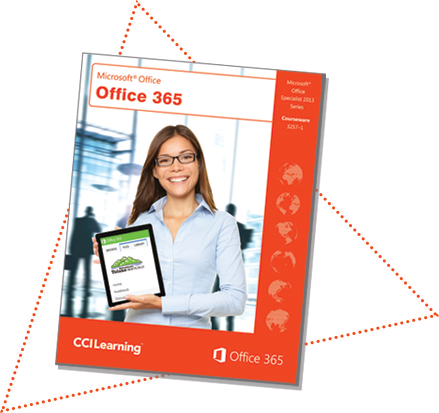 On top of all the resources within the courseware, CCI Learning also has an Office 365 microsite equipped with additional resources to practice and apply the skills sets learned with the Office 365 courseware. Also, in addition to having material that reinforces what was taught in the course, CCI Learning also provides extra information and exercises that could not be crammed into the book! That means NEW stuff in addition to the review/reinforcement material already provided with the microsite. To view the microsite, all a users must do is register at 365.ccilearning.com and they will have full access to these additional study resources. Microsoft is constantly finding ways to improve its interface and services to better fit the needs of its users. Office 365 is quite literally made for the user. CCI Learning is also passionate about the needs of our users and continues to improve our courseware to ensure the highest quality of instruction for learning. 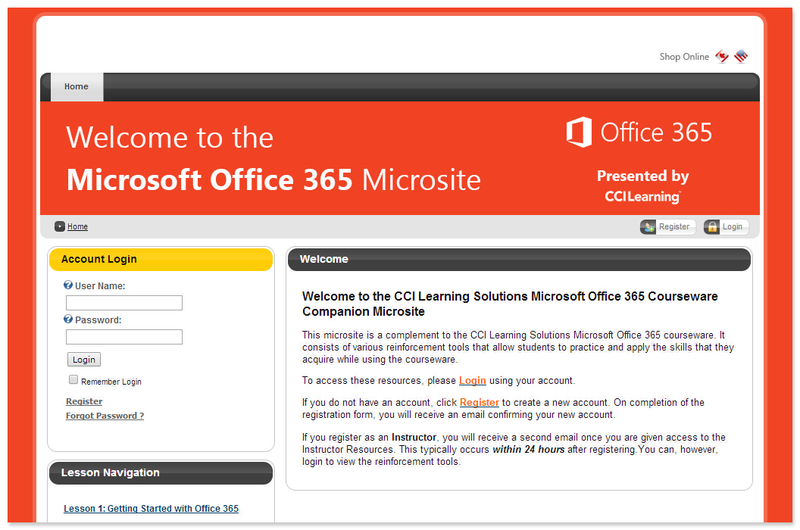 CCI Learning provides Instructor Resources as part of the complete Office 365 Learning Solution. Our Instructor Resources enhance the learning environment by providing useful tools to prepare and enhance course delivery saving you valuable class preparation time.